Generally speaking midnight is a time when people are going to bed and thus for most it marks the close to the activities of a long day. But when one day ends another begins and midnight is the dividing line that seperates one day from the next, marking a new beginning each time it rolls around. 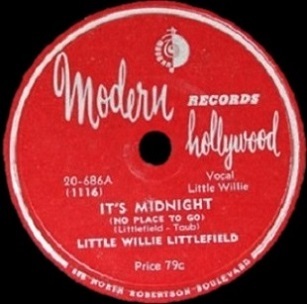 That was definitely the case for Little Willie Littlefield for whom this midnight would signal a major shift in his career as he left behind the barely solvent start-up labels he’d begun his career with a year earlier and headed west to Los Angeles and the comparatively big-time independent label, Modern Records. Now as a new day dawns he’d score his first hit just shy of his 18th birthday and in short order would be competing in the ever changing race for stardom with many of the artists he’d been looking up to not long before. In just under a year Little Willie Littlefield had cut a handful of sides for a label – Eddie’s Records – that had been created specifically to record the teenage piano prodigy after he’d gained notice playing in Houston areas bars since he was 14 years old. When that company understandably wasn’t prepared to handle the many facets of the business, especially when his first record began to draw interest locally, its owner then convinced yet another ambitious entrepreneur about town to start a label of his own (Freedom Records) with the inducement that not only would he help connect him with distributors and other key figures in getting the company launched but would also throw in an unissued side of his star talent, Littlefield, as an added bonus. While Littlefield never signed with them at least that label lasted quite a bit longer than the first and had some noteworthy artists on it going forward. But what was most impressive when it comes to the focus of our review was that it could reasonably be said that Little Willie Littlefield, who wasn’t yet old enough to vote, drink (no word on how he was able to get in those bars in the first place though) or possibly not yet old enough to even shave, had already been the impetus for the birth of TWO companies. What were your accomplishments in life by the time you were seventeen, besides successfully sneaking in the house after curfew and getting your math class to crack up at an off-color joke without facing detention? But despite this impressive feat Littlefield was unemployed so to speak when Jules Bihari of Modern Records, a much more established Los Angeles based imprint, was in Houston at a club in the spring of 1949 where Little Willie was holding court. Calling him over he asked if Littlefield would like to move to the West Coast and record for him. Just to put this in perspective Willie actually needed to get his mother’s permission to do so, that’s how young he still was and understandably his skeptical mother stated, “I’ll believe it when I see it”. She saw it soon enough, for they brought Littlefield in for his first session to show they were in fact serious and along with Willie’s buddy Don Wilkerson on sax they cut It’s Midnight (No Place To Go) in a Houston studio with just one microphone that Joe Bihari, Jules brother who was in charge of the session, called “the worst I’d ever recorded in”. Despite the meager setting the result of that session however was anything but bad and before Littlefield had even arrived in California to kick off the next stage of his career the record was a hit. The artistic maturation of Littlefield was strikingly quick and it’s doubtful that it was simply the shift to a better company which precipitated that (and don’t take the appearance of somebody named Taub as co-writer on this and other of his Modern Records to mean anything other than brazen record label chicanery as the Braun brothers notoriously attached one of their pseudonyms to nearly every song that they put out). Just because he was cutting for a new company there were no seasoned professionals in that studio to guide him, no drawn out rehearsal to smooth out the rough spots, no sitting down beforehand to analyze the marketplace in an attempt to come up with something suitable for drawing the interest of the rock fan and similarly no careful post-session examination of the results to pick through the best takes and maybe do some editing to ensure the best possible sounding product. This was just a case of turning them loose in the studio and hitting the record button and letting these teenage wunderkinds strut their stuff. To kids at that age who were talented and cocksure of themselves doing so was as simple as breathing. It’s Midnight (No Place To Go) is a clear step above and beyond what Littlefield had already cut over the past year. Not a piano based boogie as the majority of his sides had been to date, this is an actual song, not a jam session put to wax. While there’s still plenty evidence of the influence of Amos Milburn’s vocal style to be found here, that was as much a result of Littlefield’s own vocal chords and their shared Houston upbringing as anything else. Here Littlefield begins to move away from trying to mimic the slightly older star who’d made the similar journey from Gulf Coast clubs as a kid to L.A. labels and stardom a few years earlier and seeks to find his own voice in the process. The song’s slow, stuttering piano intro is intoxicating in its simplicity and becomes even more captivating when a guitar jumps in suddenly playing a glassy tone counter riff which then draws a response from Don Wilkerson’s sax. The three lead instruments deftly trade off with one another and set a smokey mood to the proceedings, none of them racing forward but rather keeping this locked into a tight groove it’ll ride to the end. Far be it for me to throw the internet into a tizzy on mere speculation but it’s certainly possible that this is Goree Carter, simply because he’s exactly the kind of person who’d be available to play on a session in the spring of 1949 – when his first records had just been released – and he’d already shown he intuitively knew how to add impeccable shading to tracks without either sticking too closely to outdated jazzier ideas or conversely by going too far into a down-home blues mindset, the two likely routes most guitarists would take at this time. Whoever it is playing this though comes across as somebody with a light touch and an ability to make each note count and his presence is an important facet for making this work. It’s offset by Wilkerson’s understated sax, offering up a constantly hazy mood by lagging behind the beat and barely delivering full resolution to his lines, giving the entire song a sense of fleeting wistfulness, something that ties in perfectly with the sentiments expressed in the lyrics. Littlefield for his part is brilliant in all three of his roles: songwriter, pianist and vocalist. Historically what made the biggest impact was his piano triplets style which would be among the most influential musical additions to the rock ‘n’ roll canon, virtually defining the arrangements of 1950’s era ballads and mid-tempo songs. Fats Domino was the one who carried it to its widest audience over that decade but he freely admitted he picked it up from Littlefield. Vocally is where Willie really shines though, his portrayal of somebody fighting a losing battle against himself in the throes of despair over a love gone to seed is perfectly realized, his mood alternately remorseful, self-pitying, defensive and stubbornly indifferent. His tone takes on some Milburn-esque tint at times but never relies on it, instead shifting constantly to adjust for whatever outlook is called for with each new line. The vocal tricks themselves are subtle but the effect is not, as he’s utterly convincing trying to dodge the ultimate responsibility for his fate all while knowing he’s doomed to take the blame in the end. His lines are delivered in stops and starts, as if he’s reviewing the underlying causes of this breakup in real time, his outlook being revealed in fragmented pieces fitting for these type of late night reflections, probably after failing to drown himself in a few too many cocktails. Left floating in the swill of a half-empty glass Littlefield paddles about in circles, never coming to any definitive conclusion, but then again never trying to either. A song like this on paper probably comes across as pretty flimsy. It’s not something that if transcribed to sheet music and passed around a waiting room full of pop crooners would find them battling over who’d get to cut it. Oddly enough Frank Sinatra of all people probably would come closest to immersing himself in the wounded pathos it contains but without a more tangible melodic structure and lyrical flow he too would’ve surely passed. But that’s frankly why the writing is so good and why Littlefield’s performance of it heightens that mood. It works precisely because it WASN’T conceived as a coherent story with pieces falling perfectly into place, but rather shows the conflicting thoughts of somebody caught in that universal state of mind upon the dissolution of a relationship. It’s so accurate in its portrayal that it would hardly be surprising if you learned Littlefield ad-libbed it in the studio after having his heart broken by a girl the night before. But whether it was in fact a stream of consciousness musing on the subject or a meticulously crafted story-line written well in advance his depiction is so multi-faceted and has such depth that it stands as one of the best compositions of 1940’s rock. This is really impressive work for any artist, let alone one not yet 18 years old, but as we all know impressive doesn’t always equate to being successful. In this case however maybe it couldn’t help but become a hit. Whether the move to a better distributed record label helped, or if the timing was just right to connect, this became an immediate smash, selling big before he even made it to Los Angeles. Once it was on the charts it would remain there for months, one of the dominant records of the last half of the year. Though It’s Midnight (No Place To Go) doesn’t break much new ground style-wise it’s so well-done that it’d be a vital document of the rock scene in 1949 even without the sudden ascension of Littlefield to stardom to give it more historical importance. His wide array of skills, his confidence in delivering it, the sure-handed direction shown by all involved which indicates the uncertainty that had surrounded so many early rock sides when it came to knowing what to leave in and what to take out was finally starting to become less of an issue across the board, makes this stand out all the more. It’s one of the more self-assured records we’ve come across, a sign that everybody was fully aware of this music’s fit in the landscape of the era. By this stage of the game rock ‘n’ roll was well established and had no shortage of hits but what it still needed was a deeper roster of stars to ensure the growth of the genre once the original practitioners died off commercially. To get another teenager making the leap from promising artist to legitimate hit-maker was more evidence this racket was going to be around for a long time. 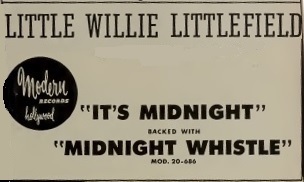 Leave a reply on "Little Willie Littlefield: “It’s Midnight (No Place To Go)”"